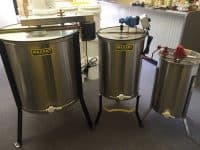 This 2 frame honey extractor is constructed from rust-proof, heavy-gauge stainless steel and is ideal for a beekeeper with 1 – 10 hives. This easy to use piece of equipment can handle 2 standard deep, or medium, or shallow frames. 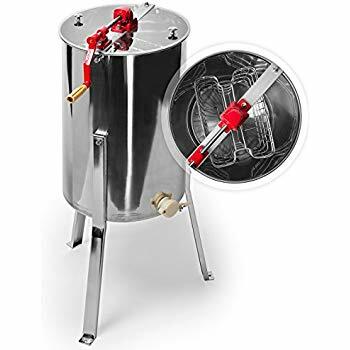 The legs are made of stainless steel and can be bolted to the floor, and drum is raised high enough to slide a 5 gallon bucket under it. The honey gate is 15 inches off the ground or remove the legs for tabletop use. 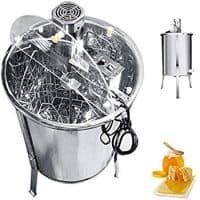 This extractor features clear plastic lids for easy viewing, sealed bearings and steel gears that make spinning nearly effortless, and a very simple assembly. The stainless steel tank is easy to clean with warm soapy water. 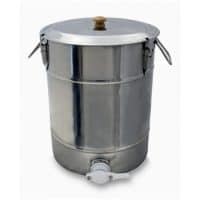 The dimensions are 42 inches high by 23 inches wide (including the handle).